Philadelphia has an excellent Open Data program (link) which provides incredible access to important data that can be used by community groups and others to help focus attention on critical issues. 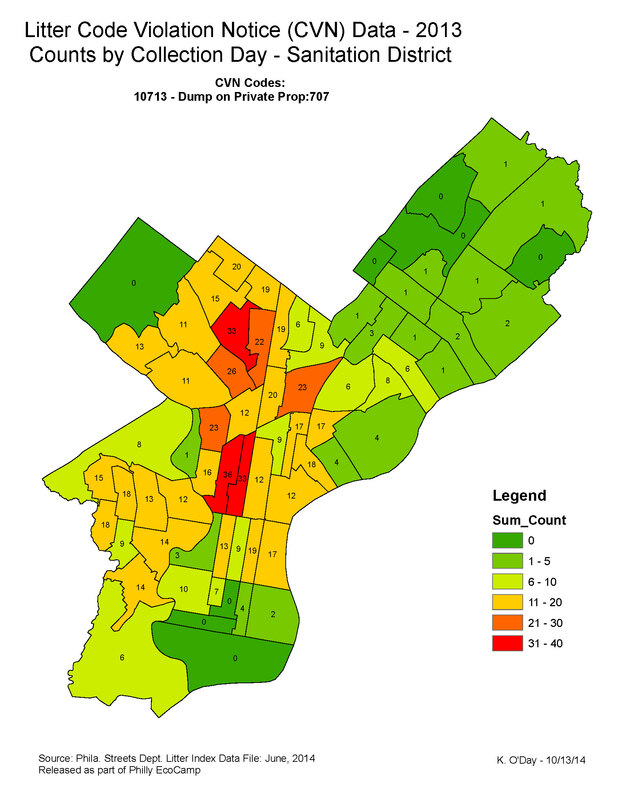 Let’s see how we can use 311 request data to understand Philadelphia residents priorities. The 311 data table also includes a link to a resident submitted photo, if provided, as well as the latitude and longitude for mapping and spatial analysis. Users can download the entire 1 million+ set of records or subset it by user selections by zip code, service request type (illegal dumping, graffiti as examples), responsible agency or request status (open, closed). You can export the entire data set or subset to a CSV file for your own analysis. I’ve downloaded both All Rows and Illegal Dumping Row to work directly with the full data set and the Illegal Dumping data set. 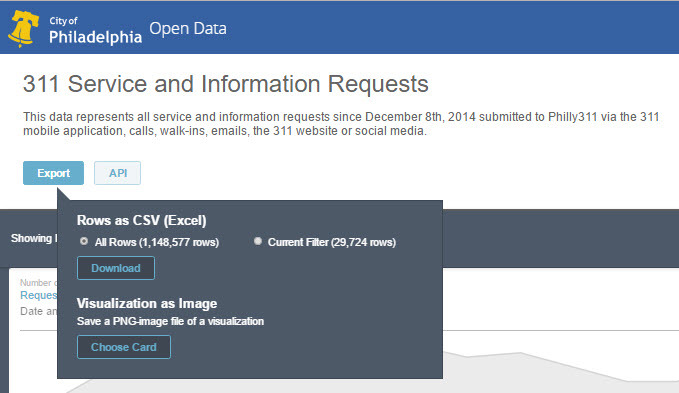 When you start looking at the service request details, the first thing that you see is that most of the requests are for information, 728,000 out of the 1.1 million requests were for information in the 12/8/14 to 12/2/16 period. 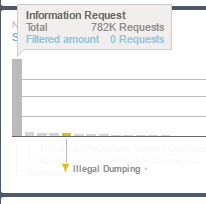 This bar chart shows requests like Illegal Dumping are barely visible because of the high volume of info requests. Let’s see what the work requests look like if we remove the information requests. 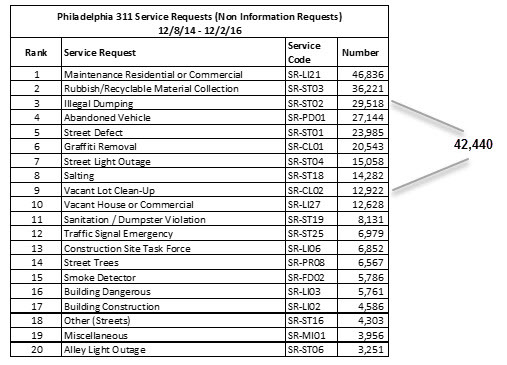 Now we can see the specific field service requests that Philadelphia residents have made. Maintenance Residential or Commercial, Rubbish/Recycle Collection and Illegal Dumping were the 3 top requests, followed by Abandoned vehicles, Street Defects (potholes!) and Graffiti Removal. Illegal Dumping and Vacant Lot Cleanup warrant special mention because they both deal with trash dumping. Dumping in the public right-of-way is handled by the Streets Department while vacant lot dumping is handled by CLIP, that is why 311 classifies them separately. The combined Illegal Dumping and Vacant Lot Cleanup requests (42,440) is the 2nd largest non-information service request. Philadelphia residents are repeatedly asking for trash dumping cleanup services. We need to recognize this priority. Clearly we need to do more to prevent trash dumping, both on City streets and vacant lots. District 8 has 4,049 street segments, 33.5% of them had 1 or more 311 Illegal Dumping Service Requests. 29 of these segments had 11 – 43 requests. These chronic illegal dumping hot spots need enforcement attention. Removing the latest illegal dump just gives the dumper proof that his/her dumping will be handled by the City at no cost to the law breaker. 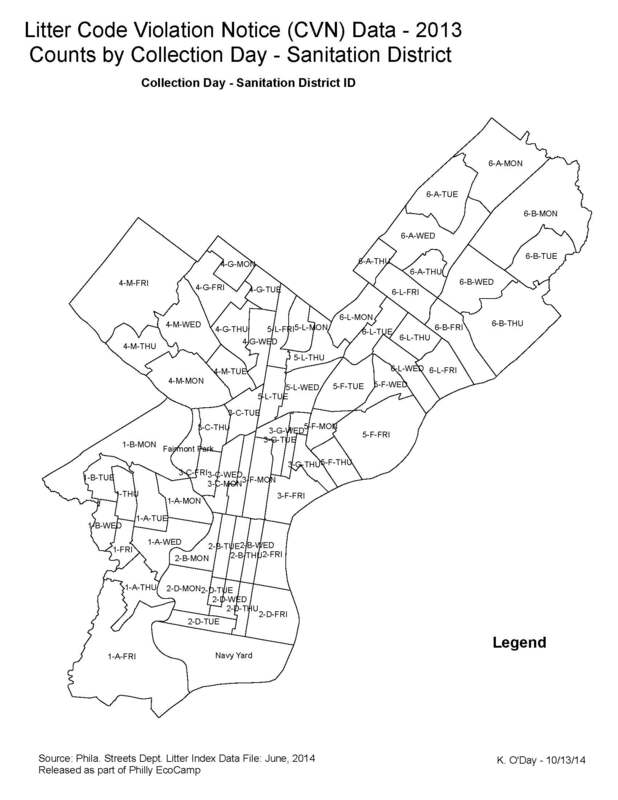 Click here or on the map image to see how Philadelphia’s 311 OpenDataPhilly files can be used by civic groups, City Councilors and others to identify critical hot spot problems in their neighborhood. There were 33,213 litter code violation notices issued in 2013. 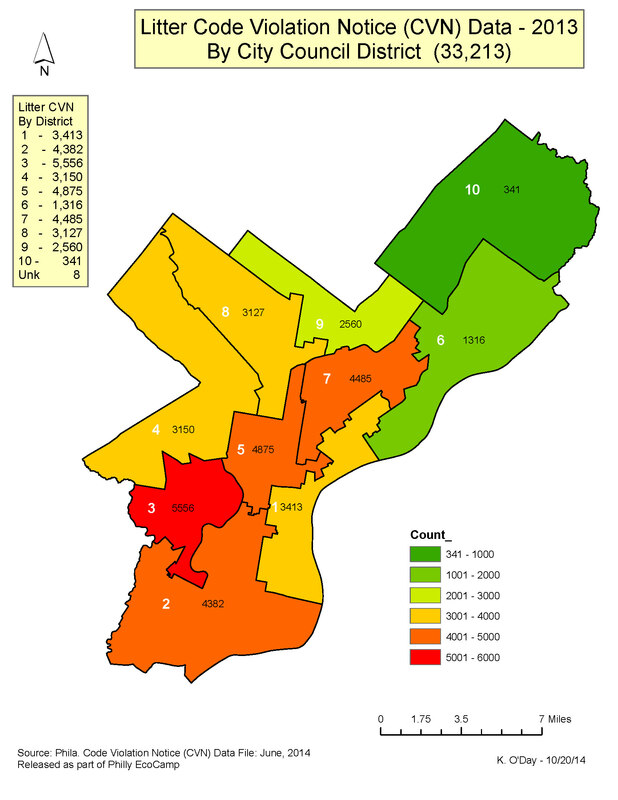 Here’s a map that shows the number of litter code violations by the 10 City Council Districts. 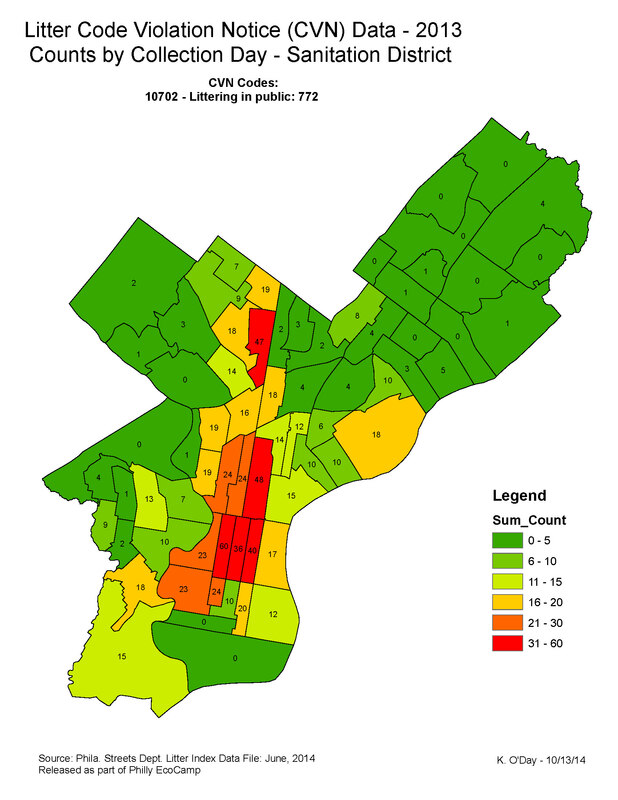 Philadelphia’s Code Violation Notice data (link) provides the raw data for interested citizens, community groups and City officials to assess the litter problem across the City. The data can be overwhelming, but GIS tools like ESRI’s ARCMap make the data analysis challenge both fun and rewarding. 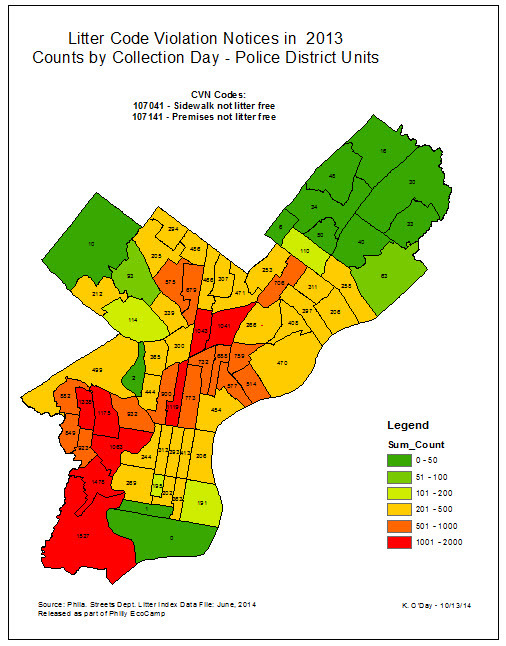 Philadelphia released code notice violations (CNV) data in June, 2014 (here, here). 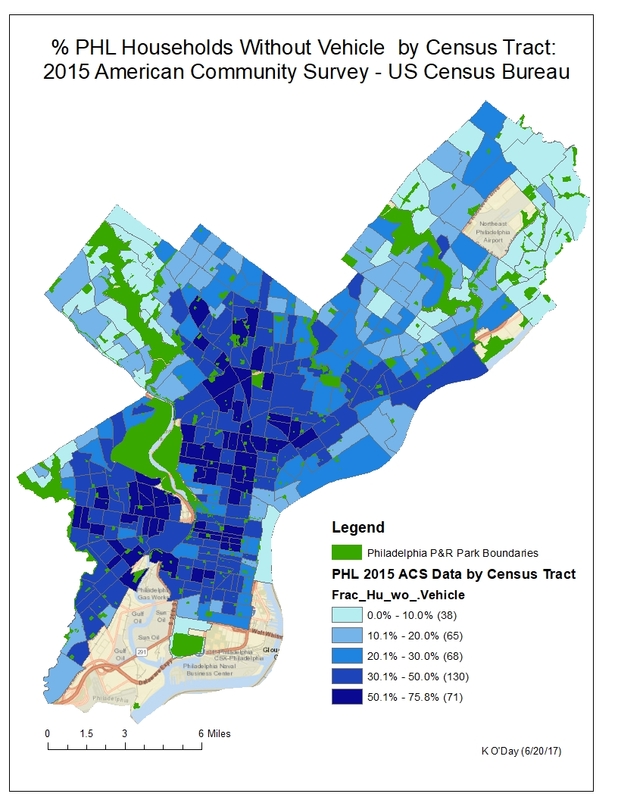 In this post I want to show an example of what Philadelphia citizens can do with the City’s data to dig deeper into the causes – locations of Philadelphia’s litter problem. 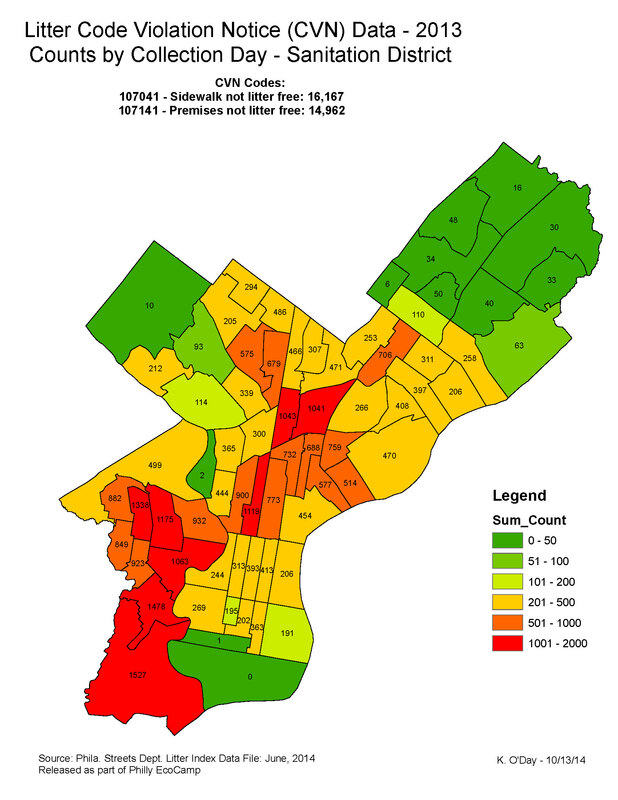 There were 31,129 litter CVN, the number of violations by trash collection district vary from 0-50 (green areas) at the low end to a maximum of 1,527 (red areas). While this map doesn’t fully explain the City’s litter problem, it does show the pockets of litter free and litter prone areas. This map, coupled with other data on trash receptacle, housing stock conditions, bus stops, litter generating establishments can begin to focus attention on necessary remedial steps. Philadelphia, under Mayor Nutter,has an excellent open data approach. Interested citizens working with the City’s open data will be able to take the next steps in tackling City litter by measuring the extent of the problem and conducing year-to-year assessments of progress.